London - Caster Semenya knew she'd blown her first Olympic final by starting out too slowly. She expected critical feedback from her coach and, based on her experience over the last three, difficult years, she expected some unkind speculation about her performance in the 800m. But she cherishes her Olympic silver medal all the same. Three years after being forced to undergo gender tests after winning the world title in a stunningly fast 1 minute, 55.45 seconds at age 18, Semenya is now an Olympic medallist, too. The South African was sidelined for nearly a year while track and field's governing body decided whether to allow her to compete. She was tested and eventually cleared to return to action in 2010, then was the runner-up at last year's world championships. She came to the London Games as a leading medal contender in the 800 and was even given the honour of carrying South Africa's flag into the opening ceremony. Unexpectedly, she slipped into last place from the start of the final and, even after a fast finishing kick from 250m out, left it too late to catch world champion Mariya Savinova, who posted a season's-best 1 minute, 56.19 seconds to win gold. "Unfortunately it was too late. I'm happy with the silver but I know the coach (Maria Mutola) is not really happy," Semenya said. "I tried hard to get back but the body wasn't really on fire today. But I had to fight." It wasn't her plan to trail at the back, but she didn't panic when she found herself in trouble. "It doesn't matter if you're back or front," she said. "What matters is how you finish your race." That's not how some critics saw it. One TV pundit speculated that Semenya didn't go all out for gold because she didn't want to create any controversy. Semenya bristled when the question was put to her later at a news conference. "The plan was, like I said, to win a gold," she said. "I just made a mistake. A late kick." Semenya doesn't put much importance on what is written or said about her by people outside her support network, something she had to learn the hard way. It seemed nothing was off limits when her intimate details were being debated and discussed in the world media before she was cleared to return to competition. Now she has Mutola, who retired in 2008 with an Olympic gold medal and three world titles to her credit, in her corner. And on Saturday night, she had her parents - Jacob and Dorcas - in the stadium for the first time to watch her compete at a major international meet. The 80 000-seat stadium, jam-packed with people cheering raucously on a night when Mo Farah won a distance double for Britain and Usain Bolt helped Jamaica set a world record in the 4x100m relay, would have been daunting for the couple from a small, rural village in South Africa's northern Limpopo province. Judging by the way she started, it was also daunting for their daughter. But the way she finished was more impressive. "For me, I feel very happy. I know my parents are waiting for me, out there watching me," Semenya said. "I just have to make them proud." Semenya finished a second behind Savinova, who also beat her at last year's world championships in Daegu. But the 1:57.23 was her best time this season. 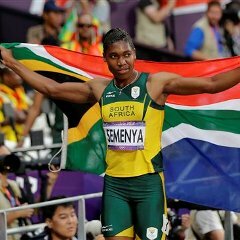 She flexed her arms in a muscular pose when her time flashed up on the screen, then she ran around the track with a South African flag until she was stopped by an official near the start for the 100ms - there was a medal presentation going on for the women's hammer. Not long after, it was her turn to step onto the podium. After being presented with her medal, she flashed a big, unselfconscious smile. "I feel very proud," she said. "Yes, I feel confident. I know I haven't had too good a season the previous two years but I think we're getting there now. "I'm very happy with silver at my first Olympics. Back on the podium. For me it's a successful career." Earlier in the afternoon, Lamine Diack, the president of the international athletics federation, was asked about Semenya's career since her return from a tumultuous, enforced break. "She's carried on. We've worked together on the problems she's had, and tried to find solutions," Diack said. "And now she's at the world level and trying to beat the others. I think she's doing all she can to win. This is now the life she's living - she's an athlete competing like any other." Seb Coe, a British distance running great who has led the organising committee for the London Games, was warmer in his recognition of Semenya, saying he was impressed with her commitment. "She's a phenomenal runner," Coe said. "She's committed to her sport, and she brings great dignity to it." Now 21 and without any impediments to competition, Semenya knows her Olympic destiny is in her hands. "For now, I just have to concentrate so I can win the next Olympics," she said. "I see a pretty good future." Together with Mutola, she said, "We just have to focus on the career and forget about the past." "I think we're going to be better in the future," she said. "That's what I will say for now."